DALLAS, Texas — Chevron revealed today its new line of CK-4 and FA-4 engine oils, which it claims to be the most “comprehensive and technologically advanced” oil line in its history. The new oils are the culmination of five years of development and will provide stronger performance than today’s CJ-4 oils in key categories, including oxidation stability, piston deposit control and wear. CK-4 oils in the lineup are a straight replacement to today’s CJ-4 oils and can be used in new and existing engines. 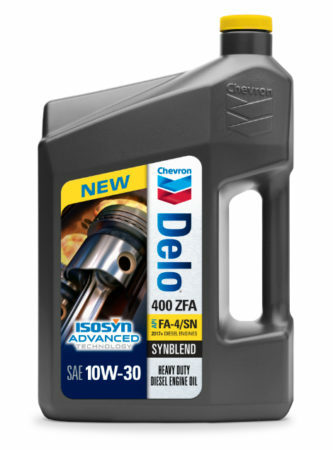 Chevron’s new Delo 400 ZFA 10W-30 Synbend FA-4, the sole FA-4 oil to be offered initially, has been specially designed for even greater fuel efficiency in 2017 and future engines. Chevron also has in the works a new Delo 400 ZFA 5W-30 FA-4 oil that will be help engine manufacturers meet future emissions standards, announced Doug Hinzie, vice-president, Americas, with Chevron. But most customers, Chevron officials acknowledged, are likely to initially adopt a single oil strategy and use CK-4 oil across their entire fleet. Delo 400 XSP 5W-30 synthetic: Chevron claims this oil will offer excellent low-temperature performance and the longest oil drain intervals in the product line, as well as maximum fuel economy among CK-4 oils. “If you’re operating in Northern Canada or Alaska, this offers fantastic start-up capability, especially in the dead of winter,” said Len Badal, global Delo brand manager. He said the oil will offer up to a 2% fuel economy improvement over today’s CJ-4 oils. It can also be used in medium-duty vehicles and cargo vans with gasoline engines. Delo 400 XSP 5W-40 synthetic: An oil that boasts 20% improved oil oxidation resistance and 50% reduction in wear compared to today’s CJ-4 equivalents, Badal said this oil has been compared to competitive 0W-40 viscosity oils and has shown equal pumpability at low temperatures. Delo 400 XLE 10W-30 Synblend: An update to its current CK-4 product, Chevron is claiming a 1% fuel economy improvement. It has also been enhanced for off-road applications, Badal said, bringing the same performance benefits to off-highway users that aren’t bound to the same emissions-reducing requirements as on-highway fleets. Mining, agriculture and heavy construction are a few of the applications this oil will fit into, in addition to on-highway trucking. Delo 400 XLE 15W-40 Synblend: Badal said this is the first 15W-40 ever to meet Mercedes’ stringent MB228.51 pison cleanliness requirements. It also offers an opportunity to extend drain intervals 25% further than the maximum OEM-published drain intervals, Badal added. Delo 400 SDE 15W-40 Premium Conventional: Expected to be the top-selling of the new Delo oils, Badal said this offering boasts a 38% improvement in wear performance and 20% increase in total engine life to rebuild compared to CJ-4 oils. To help customers select the most appropriate oil, Chevron is launching a new Advisor Service program, which will pair customers up with Chevron product experts. Those advisors will analyze the fleet’s needs and operating requirements and then suggest the best oil. The program will launch later this year and be expanded with new features in 2017. Unique packaging has also been rolled out to help avoid confusion in the marketplace. CK-4 oils will have red caps while FA-4 will have yellow. Additional identifiers will be found on the labels to prevent misfills. However, Chevron officials pointed out putting FA-4 oil in an older engine will not likely result in catastrophic damage. After all, noted Badal, 2017 engines weren’t available for testing when FA-4 oils were developed, and no signs of inadequate protection emerged when these oils were heavily tested in EPA10 and EPA13 generation engines. Still, he added it’s best to check with engine OEMs to ensure they permit FA-4 oils before using them in older engines. Backwards compatibility remains a mystery, but Badal said he’s aware of at least one engine manufacturer that will be factory filling with FA-4. The new oils have undergone more extensive testing than any previous family of Chevron oils, according to Shawn Whitacre, senior staff engineer for lubricant technology with Chevron. Nearly 1,000 pieces of equipment were included in the test phase. Whitacre said he’s confident the comprehensive testing will separate Delo oil from others in the marketplace. Hinzie agreed, taking exception to the attitude that oil is oil, and all offerings are designed to the same spec’. One customer that has bought in is Glen McDonald, director of maintenance at Ozark Motor Lines. He has been running Delo 400 XSP 5W-30 CK-4 oils as part of Chevron’s field test program and said he’s convinced of the benefits. He has stretched oil drain intervals in his Freightliner Cascadia fleet out to 80,000 miles. “We continue to see good performance,” he said. The new oils will be available Dec. 1.